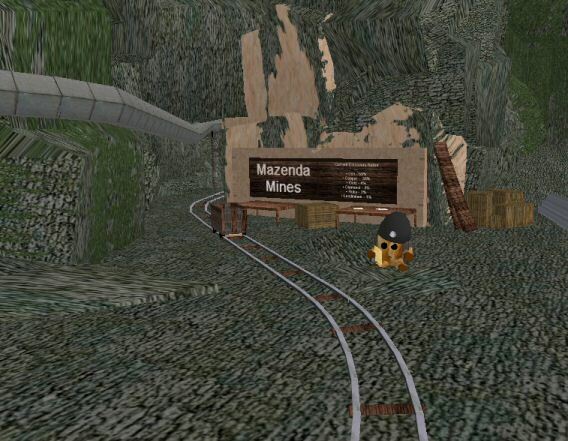 Mazenda Caves, located on Hyokia Island, is the oldest operating mine in SW City today. It is the primary supplier of precious metals and stones including gold, silver, rubies, and diamonds. It also outputs some common metals such as iron and copper. The mining network is divided into three underground levels plus the surfaces. The top level is mostly occupied now-a-days by cave-dwelling structures used to facilitate the workers. The second level has nothing but mining shafts. The third and deepest level is where most of the diamond and ruby mining is done, as well as housing the equipment bay and security center. This level eventually crawls into the natural cave network where Christouses reside. Built on the surface is the corporate office and the mineral cache. Mazenda does no refining, and sells out raw minerals to 3rd party industries. The Mazenda Caves Organization is a part of National Union of Miners Association (NUMA) as of 2003. The caves are known to be home to the Christouses race, a sheltered race of odd beings who never leave their dwelling. Mining operations within the caves to not disturb the Christouses that reside here, so they remain relatively undisturbed except for the occasional traveler that may access their home via natural tunnel system.